Elding- Old Norse: "Dawn." Originally meaning firing, fuel, related to smelting, heat, and coming to mean lightning. A later homonym means the very last period of night's darkness and relates fire to the transition from night to morning; rekindling, as in the fire of dawn. This piece represents a new dawn for me, birthed in fire and exploring visual opposition and inversion; relating to the word Elding and its transition of meaning. 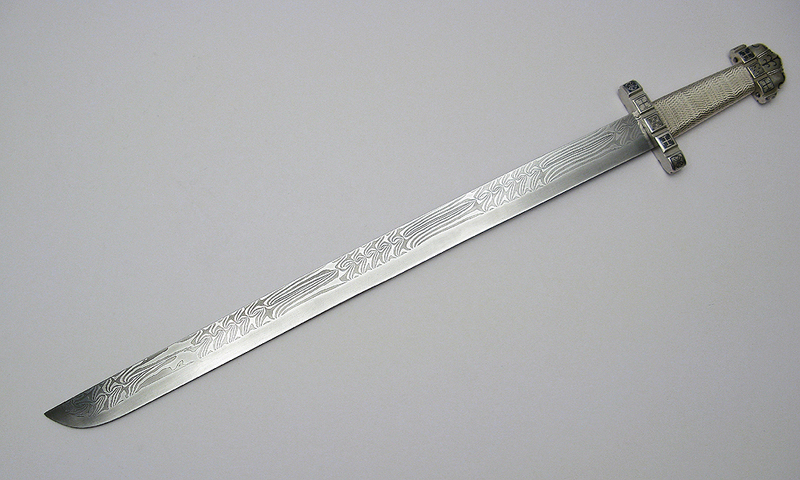 The inlaid panels as well as the blade are inversions in form, shape and positive / negative space. She is 29" overall, with 23" blade and 6" handle. The blade is an interrupted & offset twist, so as you flip the blade, the stars are always opposite the straight sections. There is a four core spine of 15N20 / 1070 with a high laminate edge of 1070. 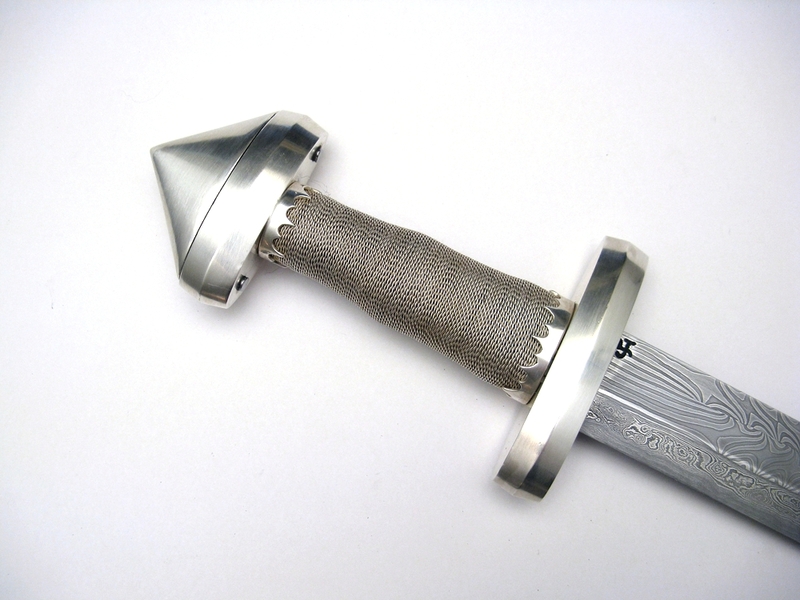 The hilt is constructed of 12 ga. Sterling silver over mild steel. The silver is inlaid with niello, a fusion inlaid alloy of silver, copper, lead and sulphur which was the subject of my senior thesis at Maine College of Art. 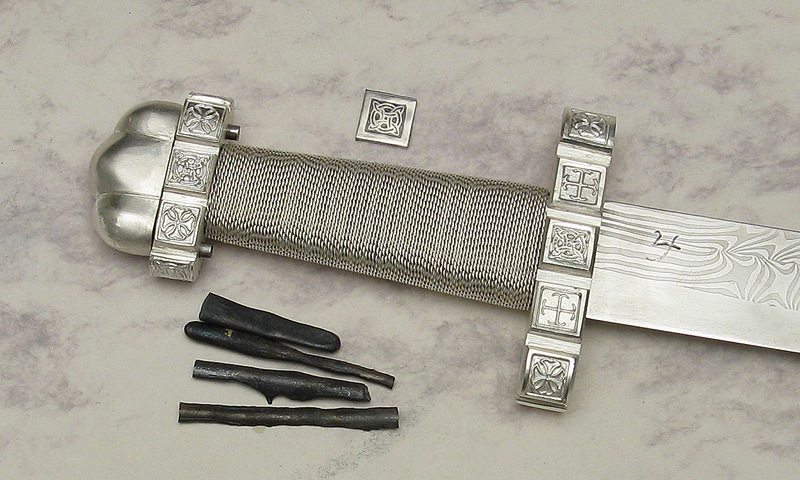 Niello is common to most metalworking cultures, including the Norse, where it frequently adorned swords. 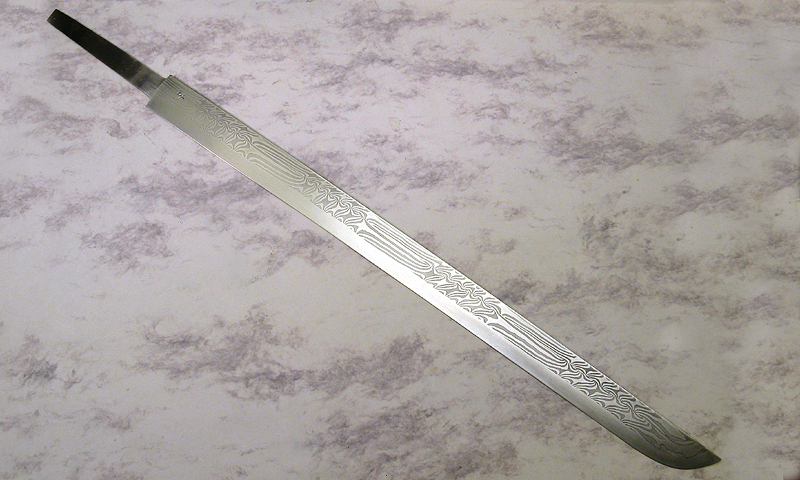 It is an involved and risky technique; one must make one's own niello, and the process of application is extremely temperamental. (The thesis, and a good explanation of the technique of niello is available here.) The handle is walnut with a fine silver twisted wire wrap. 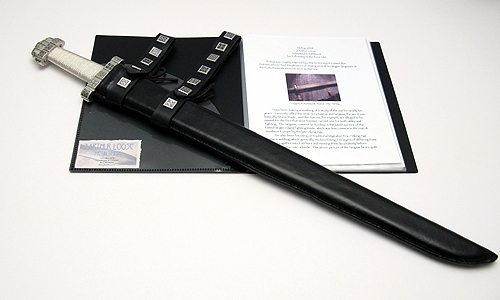 The sheath is leather over wood, with niello inlaid silver panels and features adjustable straps suitable for either right or left side dress. See much of the process here. Elding was roughly inspired by a trip to Norway & Iceland this Autumn, where I had the pleasure of viewing several Norwegian langsaxes at the Kulturhistorisk Museum such as this one. Here is an unfortunately out of focus picture of some langsaxes as well as some double-edged blades. I have been making something of a study of the sax, variously called seax, scramaseax and langsax. 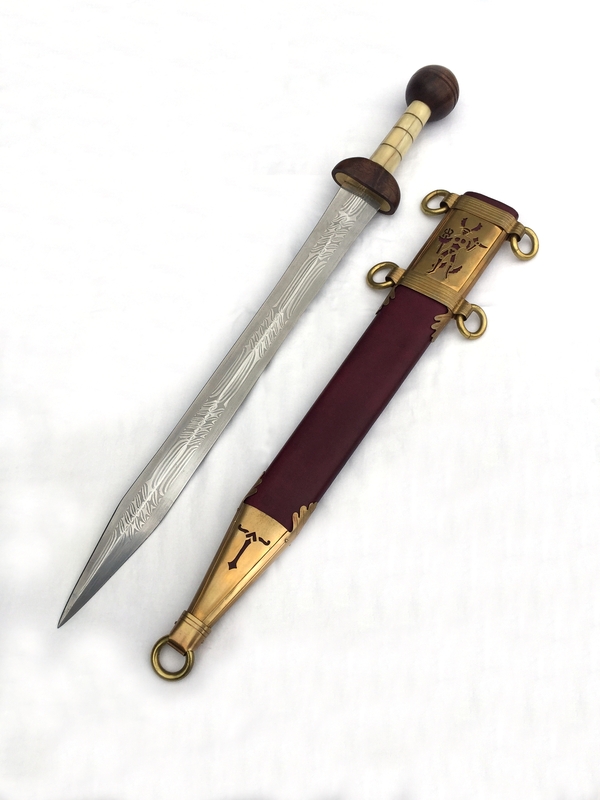 The word 'sax,' basically means 'blade,' and the Saxons, for example, are alleged to be named for the fact that most freemen carried one for utility and fighting. 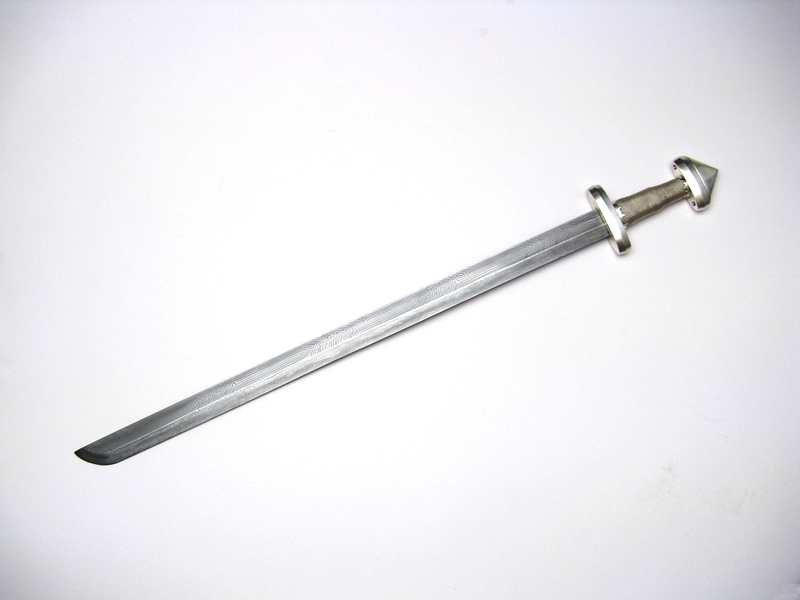 The langsax, common to Norway, is the latest survivor of the single edged fighting blade, which was less common elsewhere by the late Viking Age. 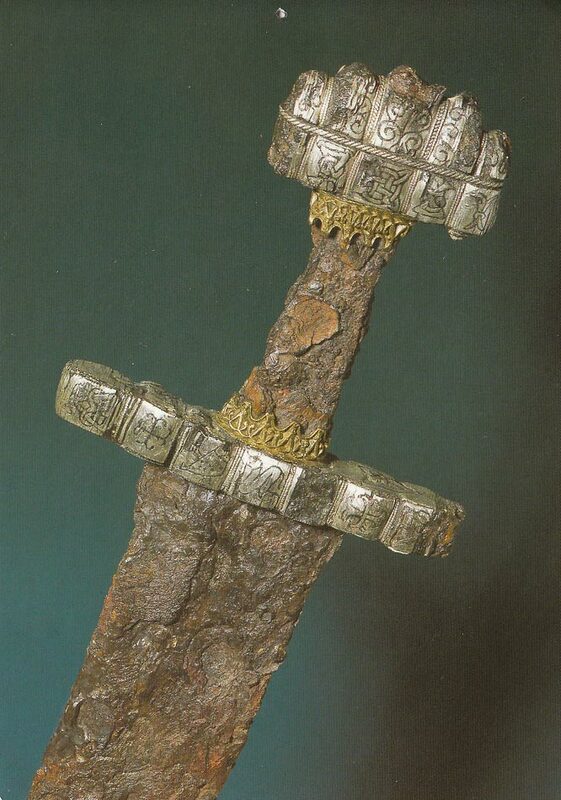 The pommel shape on most langsaxes is the triangular conical shape prevalent in the first photograph above- a Petersen type H. ( Jan Petersen extensively classified Viking hilt shapes in Die Norsk Vikingesverd, 1919.) While perusing the book I chanced upon a single edged piece with what is probably a later pommel addition of the three-lobed type, roughly type D or S. (Figure 84, here.) 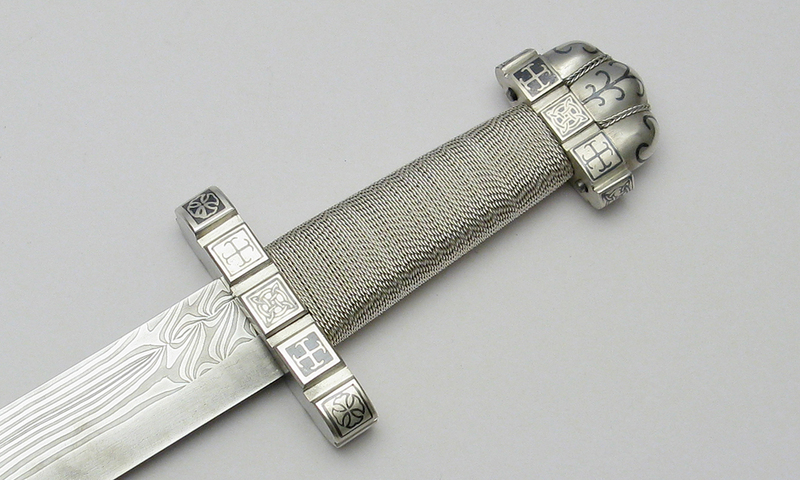 There are numerous examples of older blades receiving later fittings, and I imagine this piece to exist within that pretense. I do not consider my work to be reproductional in nature, but evolutionary and inspired by history! Then overlaid them with silver, which niello favors over iron. I then commenced with the design elements. Repeating elements such as these occur in Norse metalwork; there are a few examples of bone carvings into which wax was moulded so that repeated mouldings could be cast. 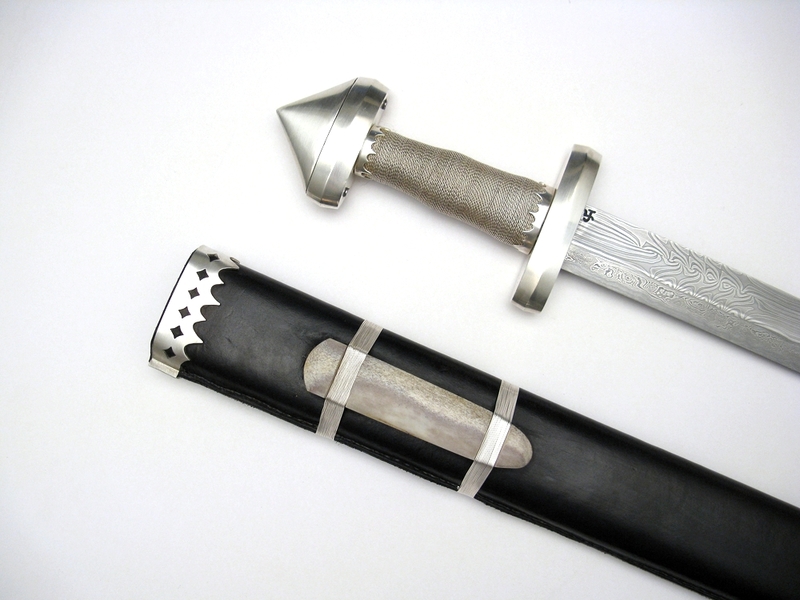 While I used modern techniques, the idea remains; here are the repeated cast elements which were affixed to the hilt. The design elements were inspired in part by a postcard I received some years ago from a friend visiting Das Archaologische Landesmuseum in Schleswig, Germany. 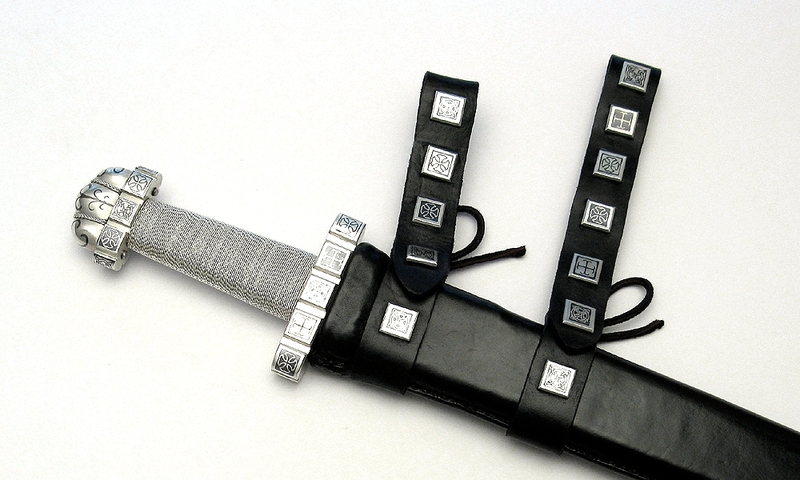 The sword hilt is likely later Viking Age and is adorned with niello. My senior thesis in college was not coincidentally a study in this lovely black inlay material. 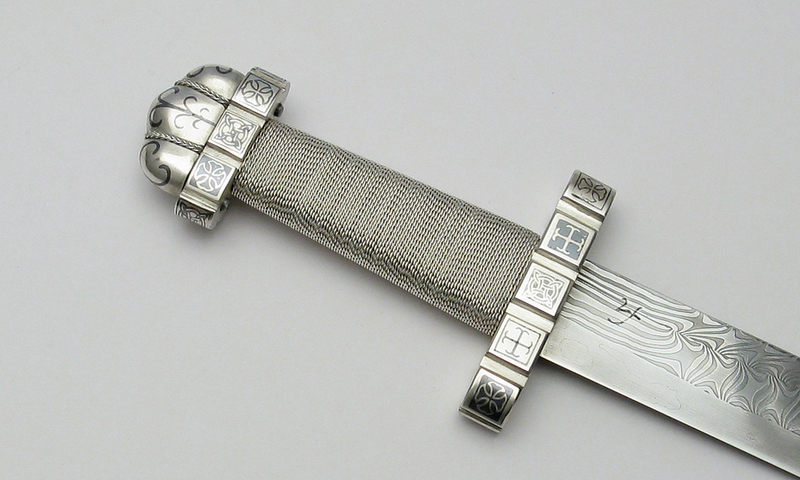 It is an alloy of silver, copper, lead and sulphur used as a contrasting inlay into other metals. The Norse used it extensively, especially on sword furniture. You can read my thesis concerning niello here. 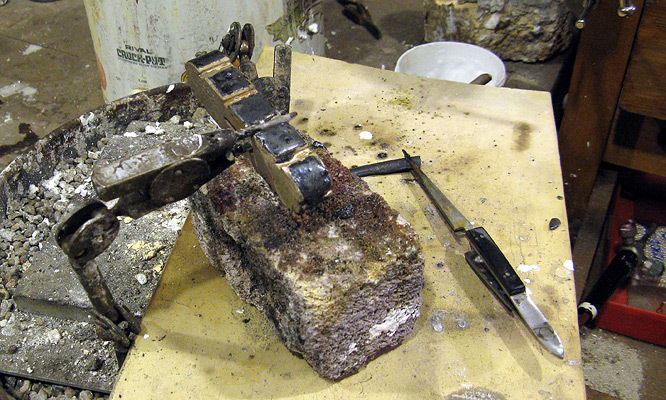 As no one in their right mind would sell an alloy with lead and sulphur in it, one must first make it, which is an exciting and engaging pastime. Applying and cleaning the stuff is also something of a task. 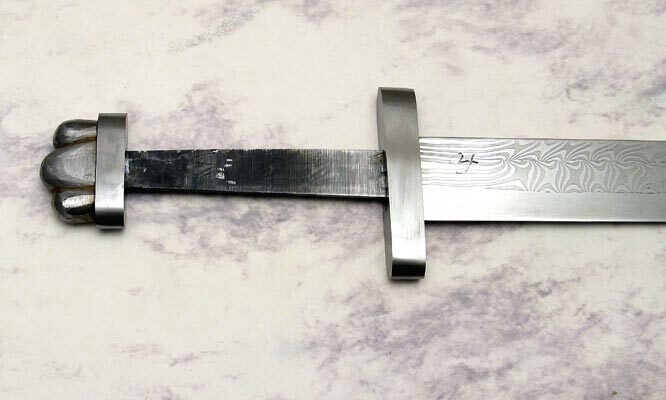 The results of putting one's nose to this particular grindstone are worth it, and I certainly wonder if the number of smiths worldwide who can make both such blades and niello surpasses the single digits. 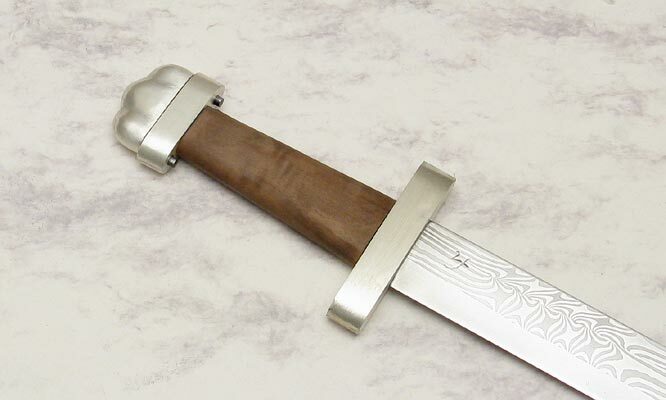 In the bladesmithing world there are a few of us who seek to remind the world of ancient things, for to pick up and hold a sword generally creates various feelings of nostalgia, awe and responsibility. 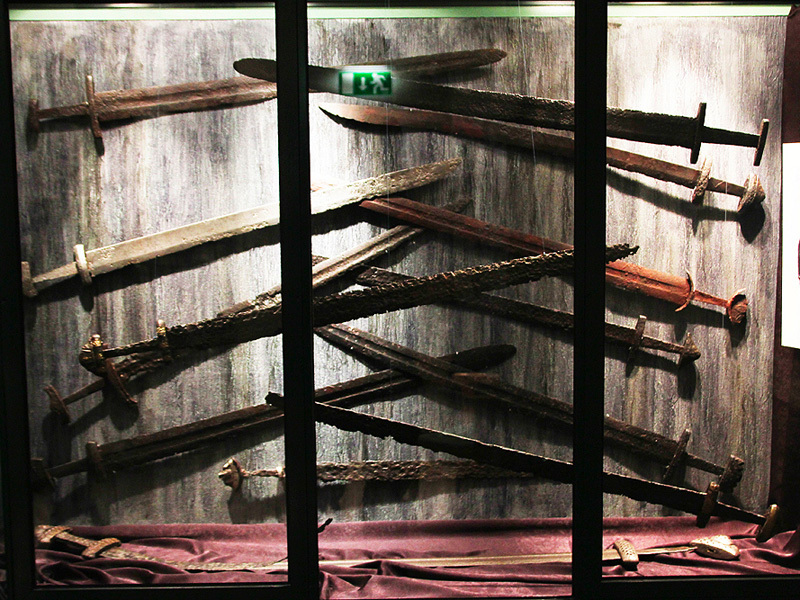 Continuing in some ways where art-nouveau left off we are establishing some conventions, such as the naming of swords. 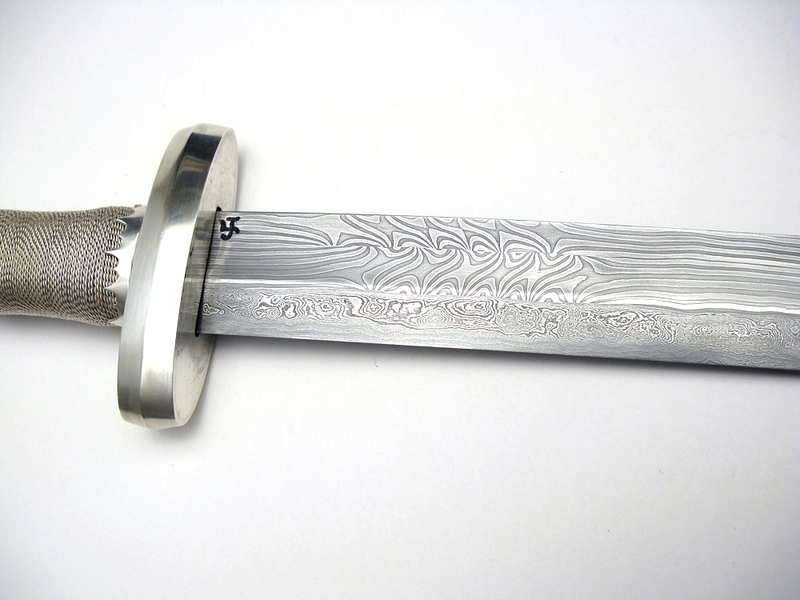 I personally would suspect that swords were rarely named by the smith, and usually acquired names and lore over time. We, however, must nurture this tradition, and so I chose to name her "Elding." 'Elding,' is an Old Norse word listed in E.V. Gordon as meaning 'Dawn.' Further examination posits that there are in fact, two such words which merge over time. Originally meaning firing, fuel, related to smelting, heat, and coming to mean lightning; a later homonym means the very last period of night's darkness and relates fire to the transition from night to morning; rekindling, as in the fire of dawn. Sunwheels in various form, birthed in fire, sparks, glowing molten salt and sulphuric plumes- inverted and in opposite relation to one another mimic the interrupted offset damascus pattern; dancing with the shift from night into morning. At Dawn Hail the Day! This blade was heat treated on a particularly cold Vermont Winter night. 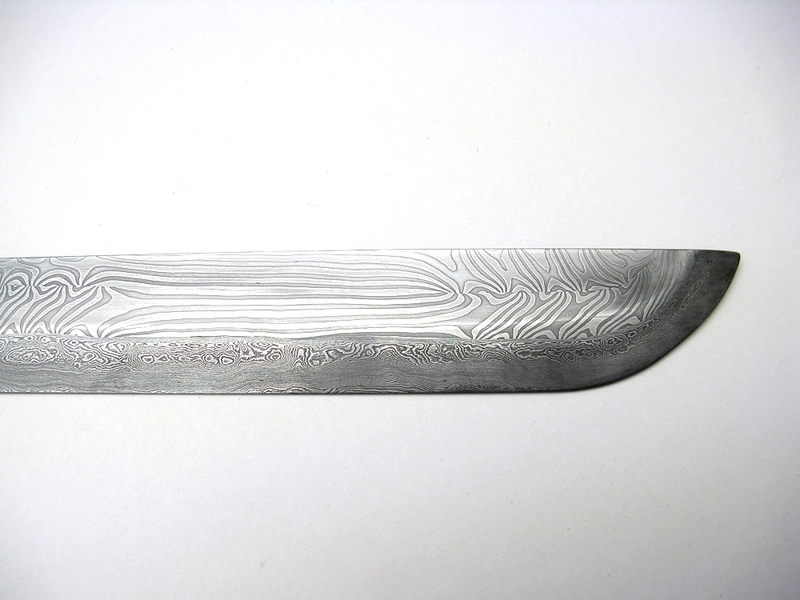 After hardening, a blade is typically tempered by going from variously around 500F to room temperature. Bringing it even lower causes more of the material to transform, especially for certain alloys, and some applications go down into the negative hundreds. Theoretically... cycling it down from 70F to -25 should make at least a measurable difference. Will it cut through an anvil now? I don't know. I didn't try. But I did marquench it and hold it long enough that I believe there's a bit of bainite in it in addition to the cold tempering cycle. If nothing else, I had a theme to work with when it came to the hilting. 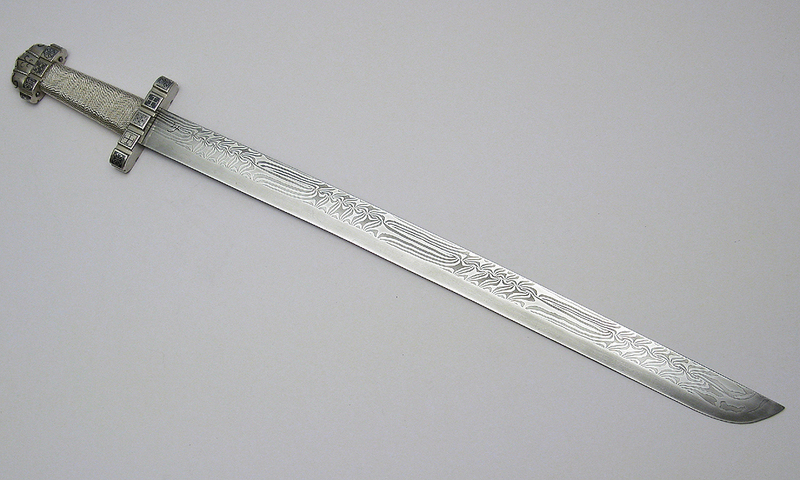 With such stark imagery I decided to include icicle-inspired shapes in the trim of the sword, and to leave the hilt covered in stark silver over iron. The handle shape is similarly icicle shaped. 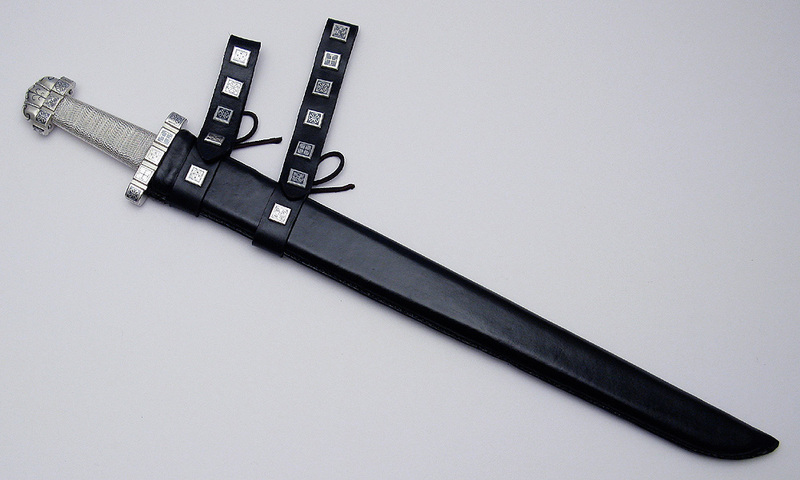 The sheath slide is a simple piece of white bone on a background of nighttime black. 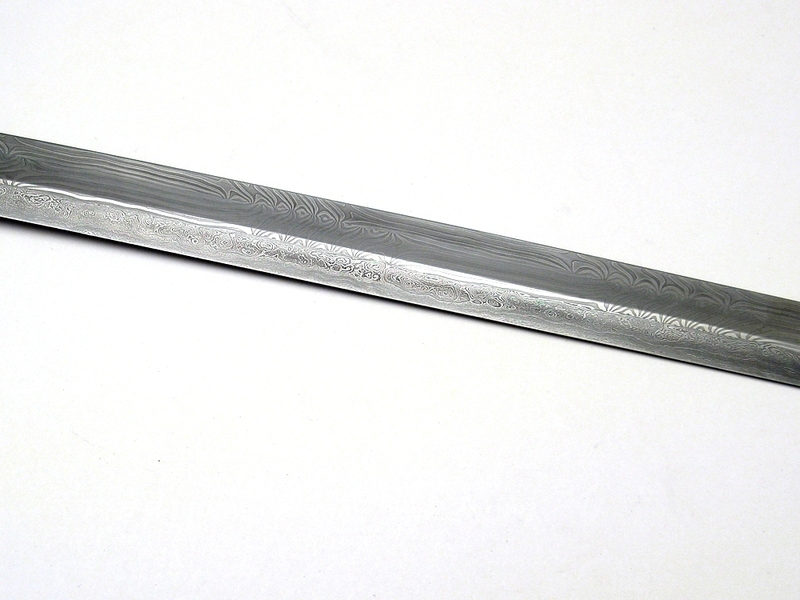 Gladius: Wotan in Mercurial Guise. 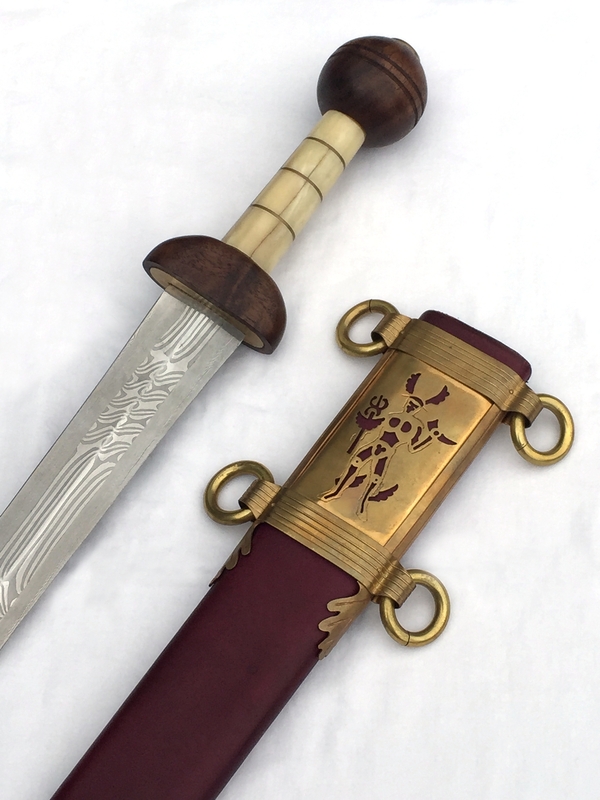 This gladius was inspired by the idea of what a Germanic barbarian serving in Rome might have wished to commission on a gladius. 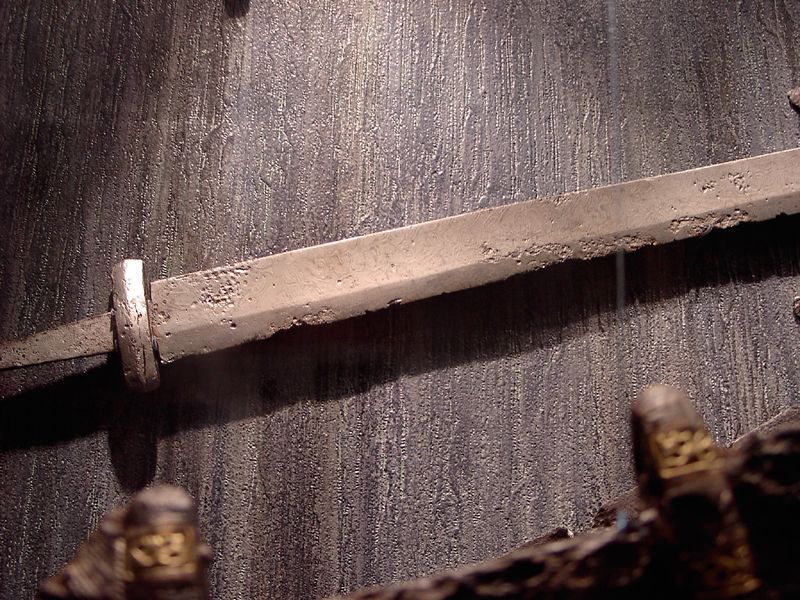 In Ancient Rome, soldiers were often responsible for acquiring their own swords, and some were quite personalized. 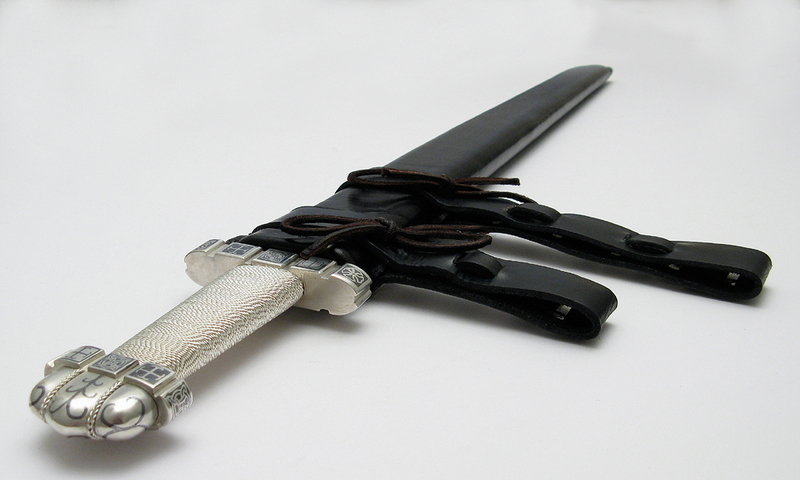 The blade is an offset, interrupted oppositional twist in a four-core and edge wrap construction. I received the photo after the customer had been wearing it for some time, and I think it has a quite pleasant patina about it.